Group trips can be a great way to spend time with family members, make new friends, and explore exciting new places. But they can be stressful if you don’t plan ahead properly. With so many people involved, group travel requires a lot of coordination and organization. If you plan on taking a trip with a group this year, you’ll want to follow these five tips to make it as fun as possible. Even picking a destination or dates for your trip can be overwhelming if you don’t give yourself enough time. You need to have a thorough understanding of budget, as well as who your travel companions are and where you want to go before you can make any additional plans. It may take several months to research your transportation, accommodations, and destination thoroughly and to find the best rates possible. Getting caught in a time crunch will only lead to increased stress and even costly mistakes. Start planning earlier than you think you need to. By the same token, you’ll want to take care of all of your bookings early on. That means you should rent a charter bus, book your flights, reserve your hotel rooms, and buy attraction and tour tickets as soon as you can. 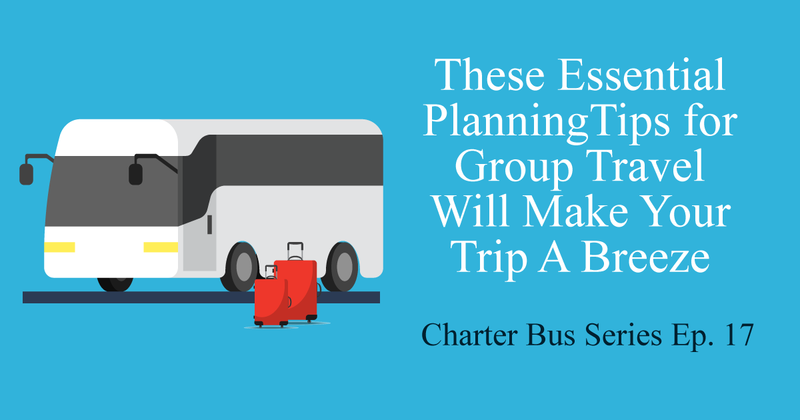 This will usually save participants money and will help you plan out the group itinerary. Plus, you’ll likely have your pick of local charter buses, flights, and places to stay. Since adults and young adults accounted for 49.9% of passenger trips provided by the Motor Coach industry in 2017, it’ll definitely pay off to rent a charter bus as soon as you know the details of your trip. If you wait too long, you may have to pay more to rent a charter bus or fly at an undesirable time. Even worse, you may not be able to secure rooms at the same hotel for everyone or there may be poor availability for activities. Remember that the early bird gets the worm! When you travel with a group, it’s imperative that everyone be on the same page at all times. Otherwise, you could easily be thrown totally off-schedule. While you should build in a bit of wiggle room into your itinerary, make sure everyone knows that they cannot be late to any group meetings. Give everyone a physical copy and a digital copy of your itinerary (you may even want to keep a Google Docs file that will update in real time). You should also designate meeting spots and ensure everyone has access to contact information, should something go awry. Your itinerary should be easy to read and understand so that travelers of all ages can follow it. You may also want to give a copy to hotel staff members and your bus driver to ensure continuity. While planning a group trip can be exhausting, it can also be incredibly rewarding. And by following these tips, the ease of planning ahead will be on your side.